For the last two days, I have been watching more episodes of A&E’s Hoarders than I should simply because it tears deeply at me. 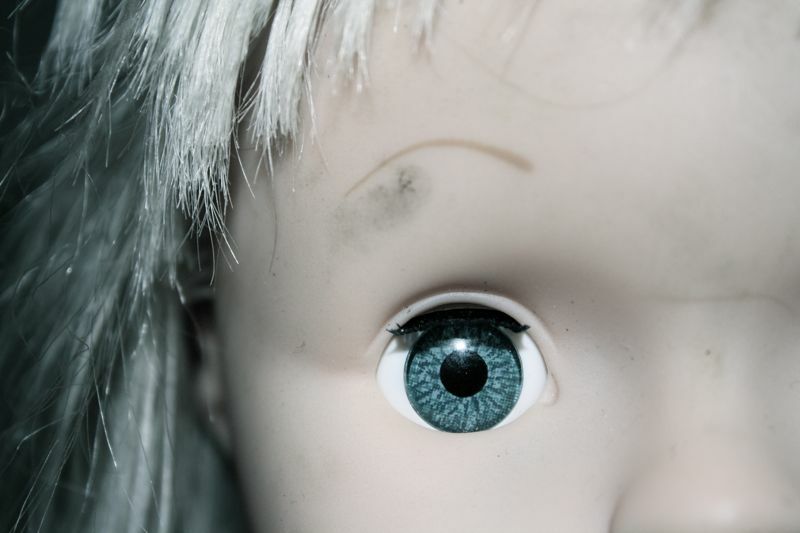 I grew up giving lives to inanimate objects — dolls, Barbies, action figures, teddy bears. Now, as an adult seeing inanimates, knowing of course they are not alive themselves, I still see some semblance of life and it is a bit terrifying while it teaches me about possession and loss, decay and habit. A couple things have struck me and have struck me deep in watching this ongoing television documentary. For one, I just cannot really reconcile the show. It is a show like so many (Biggest Loser would be a glaring example) that seems to be exploiting people first and helping them second. But I watch. So many of us watch. Why? Is it because another’s misery gives us permission to escape our own? Do we see our precarious humanity in those on the screen before us? Stumbling off of my soapbox, I consider the things that draw me to Hoarders in particular. I see people who value possessions because they see a soul in them, a memory, something that pulses with life. 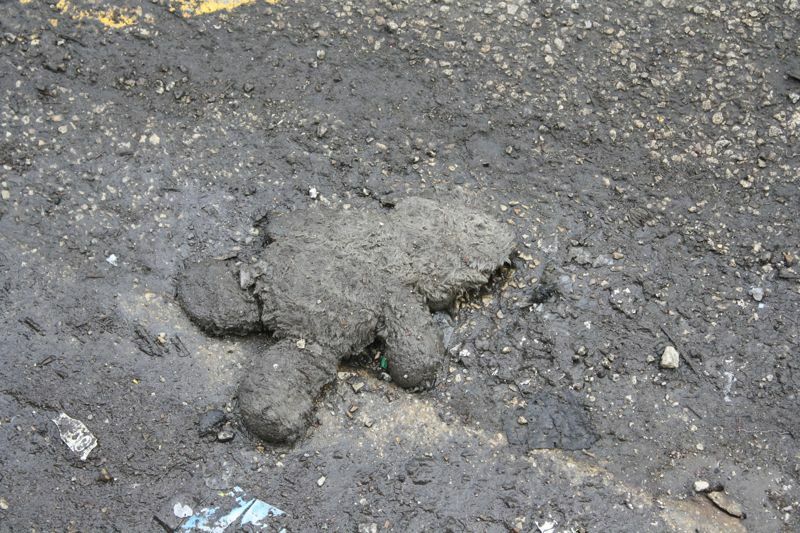 Walking through the West Loop in Chicago, leaving art galleries feeling quite visually stimulated, I saw a bear face-down in a muddy puddle near the curb. I snapped a few photos with my camera even though I wanted to pick it up, to covet it, give it something fresh, a new life. I didn’t pick it up because of its dirty realism and the slight embarrassment that would ensue if I did pick it up, but I wanted to capture the image, the moment. As I continued walking, I kept looking back at it as if I were a child being pulled away from an object that meant something to me. In reality, it didn’t, but in my reality, it did. I was drawn to it believing it had a story, a life before what I presumed to be its death. It lay in the mud among galleries filled with things that have been deemed worthy of merit and display. With art, it is often what is absent that draws me, what I believe often makes contemporary art “good” to me. Absence is something that, in my opinion, is a major part of contemporary art in particular and I think a lot of this is the loss that seems so constant in our current reality of the 21st century. Absence is what made my heart grow fond (to turn an old phrase) of that sullied teddy bear. There were narratives rolling through my mind on the long walk to the “L”, during the ride on the “L” and throughout that night. I saw kidnapping; I saw an accident, the bear falling from an opened car door and being labelled lost by the owner, or simply, forgotten. In it was mystery, despair, a bright set of careful intrigues that captivated me. This happened again, after the big blizzard we had this year in Chicago. Outside my apartment building, while I walked home in the wee hours, I saw a doll in a snowbank. She was naked but for a shirt, though a blue skirt that was too big for her was stuffed up the back of her shirt. She was missing her left arm. She had breasts as mounds of fleshy plastic even though she appeared to be a young girl doll. Her hair was knotted and wet, her face dashed with smudges of dirt. One smudge of dirt was above an eye and appeared to be put there by hands that had toiled in motor oil all day and caressed her that night. I found myself on Etsy looking for new outfits for her, it dawning on me slowly I didn’t know her. What was her dress size? Was she left or right-handed? Did she have a favorite color? Animal? Hobby? I was personifying her, making her a pulsing organism when she was really just plastic. Even her hair seemed plastic; slow blonde drawls of sinewy strings, the feel of them betraying our sense of what hair would be. But I felt a sadness for her. I tried to figure out the crime scene that became her last moments. The road was impassable because of the numerous feet of snow, so was someone walking on the street, with snow up around their knees, with her dangling from their fingers until something told them to drop her into the snowbank? Of course, too, I convinced myself (and the friend I had been with that night when I found her) that she was put in the snow in front of my apartment building and not the many others lining the street because I would be the one to rescue her, to take her in as my grandmother McGath took in hobos who had lost their way. In Hoarders I see these feelings. Then I start thinking and fearing I will be a hoarder someday. I look around and see the hundreds going on thousands of books I have, running out of shelving thinking that it is possible. I think we forget watching this and other shows like it in feigned horror that we’re all just a step away from something that is horrifying to someone else, to ourselves on some deep, denial-soaked level. The virtue of inanimates having an animation, I think, is to make us more self-aware as we look at them and have them surround us like moats of plastic, stuffing, and synthetic furs. Just as Melanie Klein used drawing and toys to evaluate and discover internal anxieties in children, I believe we turn to inanimates to find this in ourselves, whether we are consciously aware of it or not. When I worked in Vicksburg, Michigan, I remember sitting in my car outside the post office filling out an envelope. I looked up to see two dolls standing in the window of a house across the street staring not at me and the world outside, but inward. They looked to be pointed right at the woman on the couch watching television. They were her companions, a sense of security that she only needed to look at them looking at her to feel some sense of subconscious relief. My grandmother McGath used to make dolls and pose them before snapping photographs of them. I came across some of these photographs a couple of months ago on a visit home. But this is for another post. It’s all such a long, lovely story I am finding again through memory, objects she created like a goddess, photographs she took.